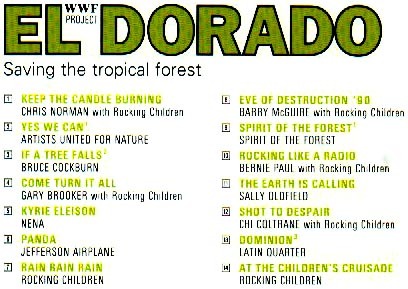 Backed by 'Rocking Children' (various German musicians) Gary sings a song named Come Turn It All on the 1990 World Wildlife Fund CD El Dorado (CBS 466324), in aid of 'saving the tropical forest'. Come Turn it All is written by Rainer Matuschek and Rudolf Leubner with Gary; Matuschek and Leubner respectively arrange and engineer the disk, which also features Chris Norman, Bruce Cockburn, Nena, Jefferson Airplane, Barry McGuire, Spirit of the Forest, Bernie Paul, Sally Oldfield, Chi Coltrane and Latin Quarter. It's a reasonably upbeat number lasting about four minutes. GB is in good voice; the band features piano, a pad of Hammond, 'copious synthesisers', bashy drums, horns and a wailing chorus. The words are well-meaning but callow, the melody not striking. Recommended for completists ... as well as for the good cause.